Blue Cruise experience, and a holiday to remember! A Gulette is a yacht typically of pine wood and styled with pointed fore and round raft. 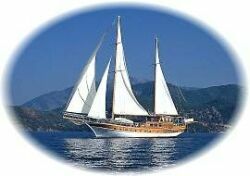 Traditionally, they have been usally and first built in Bodrum area of Turkey and hence are of referred to as "Bodrum-Type" yachts or "Gulettes", sometimes also referred to as "caiques". 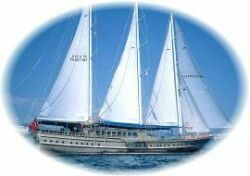 Each one is equipped with one or two masts, but because of their weight, they are in fact more suitable for cruising than for sailing. They have superior seagoing quality, are very comfortable offering large living areas, wide sundecks, spacious cabins, WC-Shower, and an aft deck with cushioned lounge area. What can you do on board? Despite other intentions, a lot of people seem to spend most of their time sipping their drinks already on the sun deck. 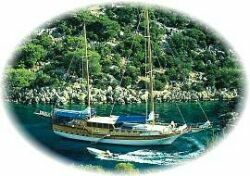 But for the energetic, we would recommend water-skiing, skin diving, fishing and walking in the woods when your yacht is on anchor in one of many fabulous coves. And you can bring anything from chess to scrabble with you. Of course the gastronome can always do nothing but enjoy food on board or go shopping in local market when feeling energetic. While on your cruise, with small extra charge, we can provide a fully equipped dive boat (10-14 meters) to follow your yacht. The dive boat will carry all of the diving equipment so that your yacht will not be cluttered and you can enjoy your holiday. A certified diving instructor who knows the cruising area will make sure that you see a new and fascinating sight each day. How can you dine on board? If you wish to spend your holidays without even having to decide what is going to be on the menu, let our management and our cook do it for you against a small additional charge, however, if you like, this can be left entirely up to you, then you can decide from day to day whether you want to eat on board or on land at a restaurant. Your captain will be able to suggest place to eat from five star restaurants to local bistros depending on where you are. And the crew will assist you in shopping in the local markets in case you wish to cook on board. They are also there to help you with washing the dishes. Drinks are available on board against a small fee. If you wish you can purchase your favourite drinks yourselves in the local markets. Again your captain and crew would be pleased to help you with your purchases. How far affield can you go? 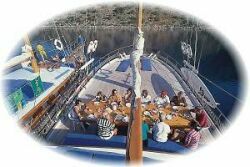 Under normal circumstances, with only a week you could cruise from Fethiye to Kekova via Aegean islands; or from Fethiye to Marmaris and back; or from Bodrum to Fethiye; or from Fethiye to Antalya. Two weeks would enable you to travel from Antalya to Fethiye via Aegean islands. To cruise from Antalya to Kusadasi, you would need 3-4 weeks. 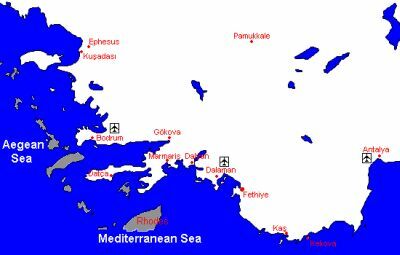 Below, you see a map showing the Turkish South-Eastern coast. If you are interested in history and archeology, you ought to take the time to see Turkish Aegean and Mediterranean coasts; we are confident that you are going to agree with us that the view of these shores are like an open air museum. We can arrange for accomodation at motels / hotels should you wish for such a change during your excursion. 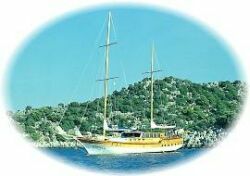 We are also prepared to help you with transfers to your yacht from wherever you may enter Turkey. Please notify us of any extras you may wish to specify when reserving your yacht, to give us time for arrangements. * The prices quoted above do not include food for the CLIENT and VAT. * Cost of food is 20 US Dollars per person, per day (drinks are extra). 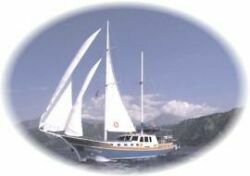 * The prices include diesel, crew, service, harbour fees and insurance for hull, client and crew. * The departure and arrival harbour is FETHIYE, otherwise you pay for extra. * The first payment of 50% must be paid to assure reservation. * In case of cancellation you will not be refunded your initial payment.